Could a summer wedding be the start of Rachel’s happy-ever-after? No, not a modern marriage of convenience story, much as I love them. The wedding is her mother’s! 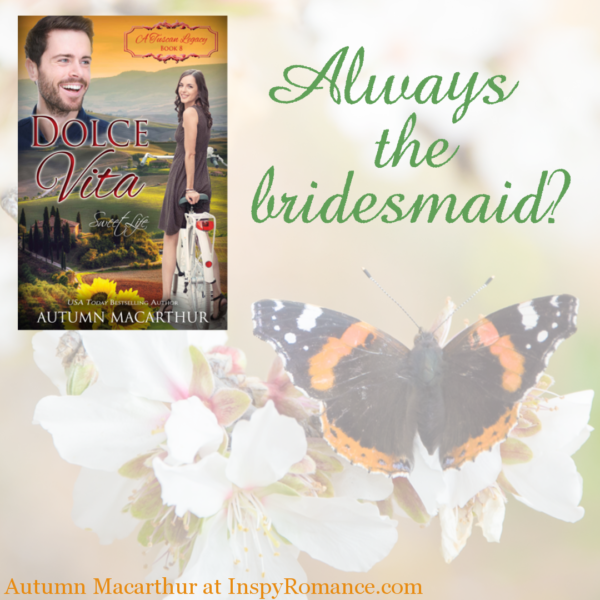 I hope you’re not tired of hearing the authors in the soon-to-release A Tuscan Legacy series talk about it, because today I have a sneak peek at Chapter One of Dolce Vita, Book #8, which went on preorder earlier this week! If you’ve read Least Expected, part of my Love in Store series based in London, you’ll remember Maggie, the unconventional fifty-something heroine with multi-colored hair, and her far more sensible and conventional daughter. Unmarried mother Maggie and half-Italian Rachel formed one of the triggers for the A Tuscan Legacy series. I knew when I wrote the story and Rach took on a personality of her own that I’d need to write her story someday. Add it together with Marion having an Italian hero’s-best-friend character she wanted to give his own story, too, and the series was born! We found a group of wonderful authors to join us, and between the seven of us wrote nine books! The first chapter of Dolce Vita is a little too long to include in a post, so, here’s a link to download your preview as a pdf file. It’s not been fully edited and proofed yet, so please forgive any grammar and spelling errors! Dolce Vita launches on June 5, and is now available on preorder, along with all the other books in the series. Visit the A Tuscan Legacy Amazon page to see all nine books! And if you’re not already a member, I’d like to invite you to join our A Tuscan Legacy Readers’ Group on Facebook. It’s a friendly and welcoming group, with lots of great conversation and some exclusive giveaways! Lastly, if you haven’t read Least Expected, it won’t stop you enjoying Rachel’s story. The Tuscan series and Rachel’s book Dolce Vita will still make perfect sense. But if you’d like to read it and see fifty-something Maggie and Ed fall in love, it’s not too late to grab my new London Loves boxed set containing their story, along with three other previously-published Love in Store books. The 850 page set is just 99c till April 17th!It’s also in Kindle Unlimited. Some wedding advice blogs recommend brides forgo the bouquet toss to save embarrassing their single guests. What do you think? Ever been the target of a bride determined you’ll be next? 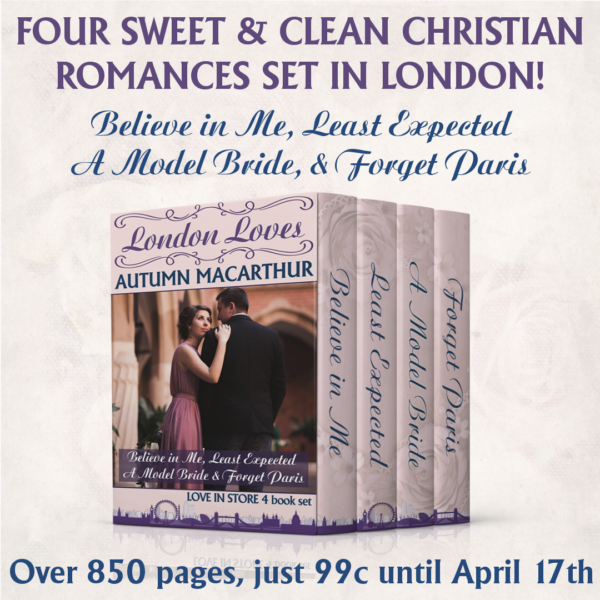 One comment on the post made before April 20 will be randomly chosen to win either an ebook copy of London Loves, or the winner’s choice of my ebooks. Hi Autumn, I have preordered the Tuscan Legacy books and am so excited for them to release. Thanks for sharing more about Rachel’s story. I have not been the target of a bride determined I will be next, and all the weddings I have been to have had the bouquet toss. I think it is a bit of fun, especially if the bride/guests do not pressure people to join in. Ps, we had a sudden winter snap today- 11 degrees (celsius) and wet, after beautiful 25 degree days, what a shock!! And thank you for preordering the books! I really hope you’ll love them! Just wanted to say thank you so much for pre-ordering A Tuscan Legacy books, Wemble! And hugs on the cold snap. Hi Autumn! No I was never the target of being the next bride. My girl friends from church and I all were married the same summer 45 years ago. I did not toss my bouquet because it was a single orchid with ribbons draped over a small white Bible. All nine books in The Tuscan Legacy are preordered. Having received several ARC copies I vouch the series is delightful. Love the mysterious motif that draws the series together. Delightful to be a lie to travel the world with this series. Thanks for not including the first chapter on this blog. I never read first chapters before the book comes out. Too confusing when I start reading the book. I purchased the London Loves Boxed set. Great price even though I already have and read some of your Love in the Stores romances. Book 2 Believe in Me had me chuckling. Where some of these stories included in a multi author boxed set? It is a rainy Saturday in Michigan, but after a frigid March; spring is finally in the air. Best wishes. Hi Renate! Thanks for much for preordering the ATL books, and for buying London Loves. That’s a beautiful bouquet idea, simple and so meaningful. I love it! Glad spring is finally happening where you are. We have a lovely day here, too. Some of the books in the London Loves series were previously released in multi-author sets, yes. Believe in Me was in Home for Christmas, which might be where you read it? Hello Autumn! I loved reading about Maggie in Least Expected! She was such a fun character. I’m very glad Rachel got her own story and thrilled you and Marion organized A Tuscan Legacy series I’m happy to be part of. And thank you for offering four of your books in a set for only 99 cents! Thank YOU for being a part of the set, Alexa! You’re such a loved and valued part of it. I’m always amazed how such tiny story sparks grow and grow. That’s definitely a God thing! I agree! That was a God thing! Excited about your books! At every wedding I have attended, the bouquet was tossed! Uh…well, mine was different as we were married in NYC on national tv on a program called Bride & Groom (long ago! lol). ‘Course I did not toss my bouquet in the studio arranged like a church. However, later at a hometown reception, I DID toss it! Oh wow, Jackie! There has to be a story in that! What an amazing and different wedding experience. The weddings I’ve been in and to have always included a bouquet toss. My daughters had a small bouquet for that purpose so they could take their bouquet on honeymoon. They were able to enjoy their bouquet in a vase for a week or so. That’s a lovely idea, Diana! I know many brides now do that, my sister did. Keeping the bouquet is a lovely reminder. My daughter did not do a bouquet toss. Her bouquet was very simply made with three calla lilies. As the reception closed down, she gave one lily to each of the grandmothers present (her two and her new husband’s one). There were some tender, precious moments there at this unexpected gesture – much more meaningful than winging the thing through the air! Awww! That’s beautiful! And yes, far more meaningful. Your books are next on my list to read. I’m sure I’ll enjoy them. Thanks for your interesting blogs. Thanks so much, Mary! I hope you enjoy the books! Forgo the bouquet 💐. That’s a silly idea. It’s a fun part of the wedding celebration and at least it gives that lady a glimmer of hope that the day is coming. That scene was great fun to write, and came together so easily. The collaboration with other authors has been one of the highlights of working on this series for me! This is going to be a wonderful series. Looking forward to reading each book in the series. Thank you, Ann! I am too. I have all the other authors books lined up and ready to read once mine are off to my editor! Yes, I had been a target several times. Even stepped away from the hurtling bouquet and let it fall on the floor. Regardless, quite happily married for 17 years…. LOL, at stepping back. Wise move! Yes, as Rachel tells her mother, catching a pretty bunch of flowers won’t change God’s plans for her. They just turn out to not be what she thought they were! I don’t know, nor have I given it a thought, as to either go or forgo the bouquet toss since I know it’s going to be a while till I’ll have to worry about it, lol (early twenties, never dated). Now, even though I’ve never exactly “been the target of a bride determined I’ll be next”, I remember being at my aunt’s wedding and (sadly) standing right next to the girl she was determined should be next. Shockingly for me (and I think some of the people around me, including the intended one), knowing as how I’ve never been known for having “ninja”-reflexes or anything of the sort, embarrassingly enough, said reflexes decided to make an appearance right at the bouquet toss, leaving me with a bouquet that clearly hadn’t been meant for me and that neither I had wanted in the first place. Oh, and by the way, I was only a teenager at the time (I know, talk about a “wish the earth would open up and swallow me whole” moment). Oops, Priscila! How embarrassing for those instinctive reflexes to pop up at just the wrong time. Cue plenty of blushes! Hmm, never too old, Amy. Especially judging by your photo! Aren’t you sweet. I should explain it’s because I seem to have moved from the years of friends getting married to my cousins’ kids somehow getting old enough to have weddings. It’s kinda weird how that creeps up on us, isn’t it! I definitely find it embarassing to try and catch (or not chatch, actually) the bouquet. I’ve moved too far away from my friends :( to be able to actually make it back to weddings (except for family ones), so I missed most of the bouquet tosses. In my own wedding I thought about this though and decided to toss a different bouquet (my tulips would probably not have survived) and I know a few women were embarassed (unfortunately), but a few actually were engaged (or planning to) and were making fun of their boyfriends about them catching it. A dear childhood friend caught the bouquet and she and her boyfriend were actually happy about it, since they were talking about weddings already. They both decided to take pics with the bouquet. I hope they’d used it for wedding announcements or something (but again I did not make it to their wedding). Hi Priscila! Oh, I love tulips! Such beautiful flowers. But fragile, too. It can be difficult when we’ve moved away. It’s not always possible to travel cross-country or abroad to attend friend’s weddings. I’ve had to miss a lot of friends and family events, too. Oh, with your bouquet toss, how sweet that a good friend caught it and it was just what they needed! LOL, for some reason that suddenly made me realise I need to add the wedding photographer into the scene at Maggie’s wedding. A photo will be the perfect reminder of that moment of catching the bouquet. When younger I was at several weddings. I thought it would be fun to win the bouquet toss. Sadly I never caught the bouquet. I thought it was a lot of fun though. Thank you for a chance to win your book. Hi! Thanks for visiting and commentinf! I never caught a bouquet at any of the many weddings I attended as a single woman, either. LOL, yes, it was a lot of fun trying!